Recorded in celebration of his 90th birthday, Francis Jackson remains one of the finest, best-loved and most versatile church musicians of his age. The eleven works on this disc, none of them previously recorded, have all the colour, emotional depth and attention to structural detail that are consistent hallmarks of his style. 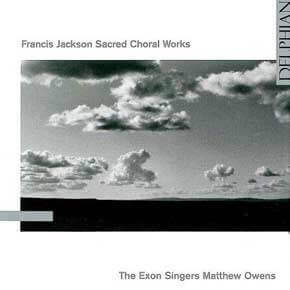 Working closely with the composer, the Exon Singers bring their customary blend of virtuosity, intense commitment and subtle responsiveness to this special birthday tribute. Recorded with the generous support of the Finzi Trust.